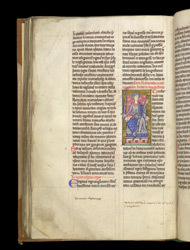 This miniature occurs at the start of a charter (in English rather than Latin) of King Edward The Confessor. He is depicted as a young man dispensing judgement with his raised sword in his hand, rather than as the saint be became after his martyrdom. The cursive inscriptions in the lower margins are guides for the rubricator.